Casita de Maya is the only Hotel within walking distance from Cozumel International Airport. Providing the Elite and Casual traveler with clean, safe, and comfortable accommodations. Our guests can enjoy easy access to Taxi Service, Rental cars, Tours and Island Excursions. Our property provides facilities to make work as well as relaxation as easy as possible. 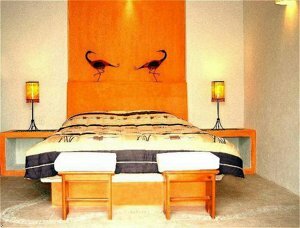 All rooms are appointed with Ralph Lauren quality linen's and fine towels. Refrigerator and Satellite TV in each room help you relax and enjoy the comforts of home. Remote controlled mini-split A/C units provides additional comfort. High Speed Internet ports included in each room. Free calls to USA/Canada. A Crystal Blue pool is located right outside your Room for a refreshing pleasure. Please note that a 2 NIGHT REFUNDABLE DEPOSIT is required at time of booking. (*Please read Xcl-policy*) Thank you for reserving with us!